As humans, even we experience hair fall and flaky skin. So, it’s kind of wrong on our part to judge our pups leaving their hair follicles all over our couches. Shedding is an important process for all living beings (humans and dogs alike) to get rid of unwanted hair or dead skin cells. 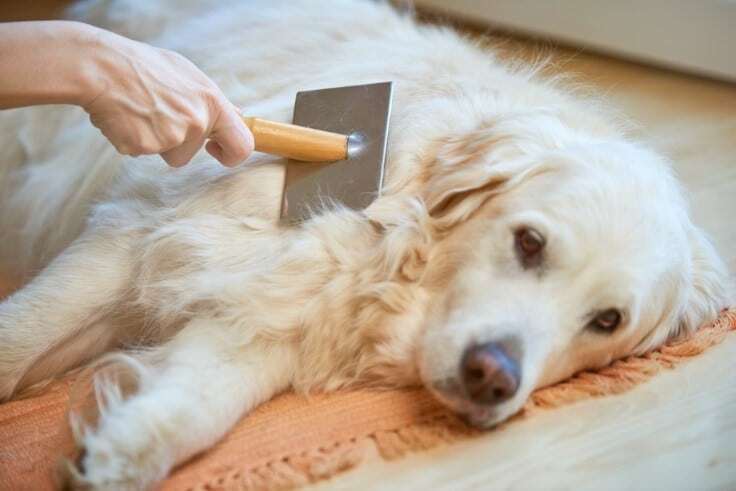 You can’t possibly teach your dog to brush their own fur. So, take some time off from your day and spend some quality time with your dog. Try brushing their fur as often as possible. Be gentle and invest in a good quality brush. Consult your vet to know which type of brush would give your dog that relaxing feeling. If not several times, try brushing your Snoopy at least once a day. Most of us are willing to go through massive measures to prevent hair loss. Whether it’s following a strict diet or taking in supplements- we’re willing to do it all! So, why not put in the same effort for our pets? You can start by meticulously checking the nutritional information at the back of your dog’s pet food and other additional adjustments during purchasing. Stay updated about pet nutrition and diet by subscribing to important channels and magazines. To thwart the amount of fur loss, provide them with a healthy diet consisting adequate amounts of protein, vitamins, and minerals. Remember, bad nutrition is one of the leading causes of excessive shedding. In order to control fur shedding, you have to take care of your dog’s fur in all ways possible, the same way you do for your own hair. Give your Snoopy a nice little bubble bath every week with fun toys around. In addition, if your dog is prone to lice and flea attacks, wash them with medicinal soap recommended by your vet. Dry them well after the shower and reward them for bathing, since as we all know, they’re not a big fan of it. One important factor to be noted is that every time you bathe them with shampoo, it robs their coat from retaining natural oil. Hence, don’t use shampoo every time you bathe them. No matter how busy your weekly schedule is, you must find time for your dog’s health check-up. If you’re unable to take them to the vet, ask someone to do it for you. Excessive fur shedding is often the cause of bacterial or fungal infection, allergy, and low immunity, and cancer, diseases of the organs or exposure to harmful chemicals. In order to maintain good health, don’t forget to attend these appointments. Of course, you can minimize the amount of your dog’s shedding by brushing, bathing and giving them proper nutrition. So, to take care of the rest, you must invest in a good quality vacuuming machine, to clean up the fur left on the furniture. Although there are other ways to remove fur from upholstery, such as using a lint roller, a damp cloth, toothbrush or rubber gloves, vacuuming is the easiest and the quickest way, in my opinion. Vacuum cleaners are useful even to clean the floors. You can mop the floor later on with water. Avoid using cleaning chemicals, as your dog is prone to licking and sniffing the floor. Change your dog’s water pot, clean it every day and give them fresh water to drink in order to prevent dry skin and other health ailments. To improve the health of their skin, pour a small amount of edible coconut oil in their drink. When bathing your dog, mix some oatmeal into the tub water. Take some time bathing them, for about 10 minutes, then let it towel dry. Additionally, apply a mix of pure olive oil and Vitamin E oil on their coat for the prevention of fur shedding and dry skin. You can also cook them meals with flaxseed oil and olive oil. Dogs can stress as well. To prevent this, let them play outside in the sun for a considerable amount of time. Not only will they get some much-needed Vitamin-D, but they’ll also get plenty of fresh air. So to sum up, we can conclude that dogs need more care than most of us thought so. They need to be loved and pampered. Brush their beautiful fur every day and give them a bubble bath with oatmeal for stronger hair. Expose them to sunlight, fresh air, and pure water to improve their skin and hair. Finally, don’t miss appointments for their health check-ups. Invest in a quality, multipurpose vacuum cleaner that can clean almost everything from fur to clothes to carpets and so on.